It is Friday and with the weekend nearly here, that means we are sharing our readers' favorite Royal Caribbean photos. Each week, we ask our readers to send us Royal Caribbean photos to share on the blog. We start off with this photo by Daniel Stober, who simply wrote that he really likes Royal Caribbean's French Onion soup. William Wickham took this photo of the grand opening of Izumi on Adventure of the Seas, which is the first Izumi location on the Royal Promenade. Next is a photo of the Sunshine Skyway bridge, taken while Terry Wooten was on Brilliance of the Seas departing Tampa. 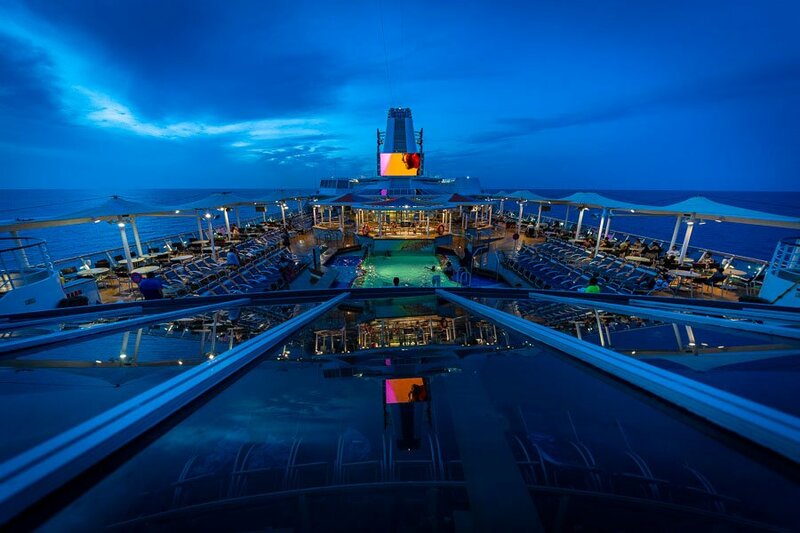 Check out this beautiful photo by Twangster of the Empress of the Seas pool deck at night. Alan Fulton captured a shot of the sunset behind Explorer of the Seas as ther ship departed Tracy Arm Fjords. Martha Kowalik took this photo but cannot remember if she took it in Cozumel or Costa Maya. That is how you know she had a good time on this cruise. We wrap up this week's photos with a shot of Symphony of the Seas in Naples, Italy, taken by David Berenbaum. Thank you to everyone for sharing these great photos. If you want to include your photos too, please send them to us via this form!